Sometimes you just gotta have something a little crunchy and a little sweet. 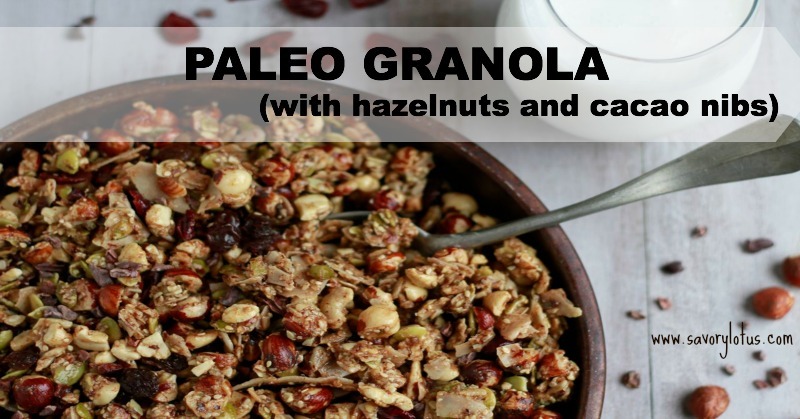 This Paleo Granola with hazelnuts and cacao nibs is just the thing. You may have seen my post of 3 Ugly Truths about Breakfast Cereal. Yeah, bummer! Breakfast cereal is not a health food. It actually is loaded with GMOs and undigestible proteins. Not good for you or your digestive health. But don’t worry. 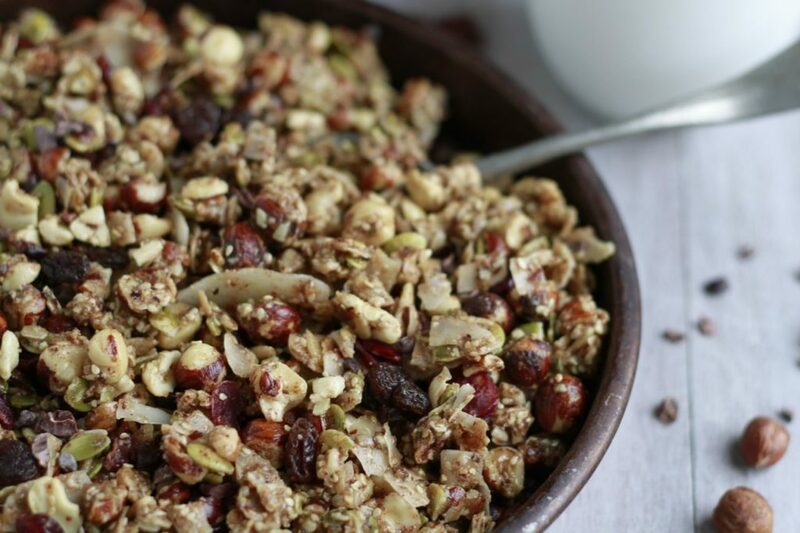 You can still indulge in the occasional cold cereal with my version of paleo granola. It’s loaded with protein-rich nuts and seeds and lightly sweetened with raw honey. 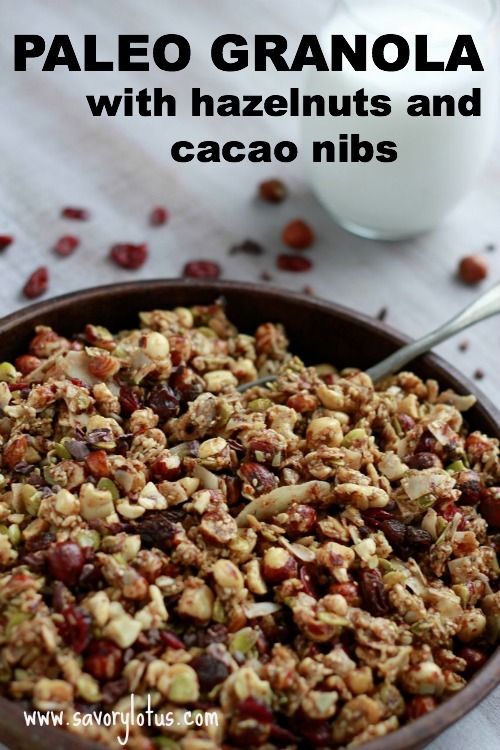 I add antioxidant-loaded raw cacao nibs just for fun. I make it with nuts and seeds that have already been soaked and dehydrated so it’s much easier to digest. Read more HERE on how and why to soak your nuts and seeds. Having jars of soaked and dehydrated nuts and seeds ready to go in the fridge makes making delicious foods and snack super easy. Enjoy a handful of this tasty paleo granola for an easy on-the-go snack or pour a little homemade coconut milk or homemade nut milk over it and dig in! 1. Dehydrator: My favorite option, as drying at lower temperatures (below 118’F) preserves valuable nutrients and enzymes. Mine takes about 20 hours. (THIS is the dehydrator that I use.) I use unbleached parchment paper on top of my mesh screens. 2. Oven on lowest temperature: This will take 2-4 hours depending on your oven. Flip it a few times in the process. Just be sure the granola is completely dry. I line my baking pans with unbleached parchment paper or a silicone baking mat to avoid sticking. 3. Baked in the oven: This will give you a nice, crispy, slightly roasted granola full of flavor. Bake at 275’F for 20-25 minutes, flipping the granola at least once. Watch the coconut flakes as they burn easily. Pulse hazelnuts, cashews, pumpkin seeds, and sunflower seeds in food processor a few times until broken up a bit. Dump into large bowl. In a small bowl, combine melted coconut oil, honey, and nut butter into a smooth paste. Add vanilla, cinnamon, ginger, and sea salt. Mix thoroughly. Pour oil/honey mixture over chopped nuts and stir until completely coated. Fold in coconut flakes and sesame seeds. Either dehydrate at 115’F until completely dry OR use one of the baking methods mentioned above. Once the granola is completely dry and cool, mix in the cacao nibs and dried fruit of choice. Store on sealed glass jars either in fridge or in the cupboard. Enjoy! Do you love grain free snacks? Check out my Hazelnut Sesame Bars and Coco-Banana Balls as well. 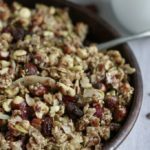 I just wanted to thank you for this amazing recipe which has been my go to granola for years!